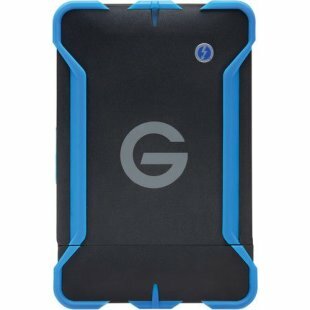 The lightweight and portable 1TB G-DRIVE ev ATC with Thunderbolt from G-Technology is a rugged, bus powered, all-terrain drive solution with a tethered Thunderbolt cable that helps shield and protect a removable G-DRIVE ev RaW USB hard drive. While properly encased in its enclosure, the drive is well protected against falls up to 6.6' / 2.0m on a carpeted concrete floor. The watertight enclosure will float, and if it happens to become submerged, the watertight compartment will protect the drive in up to 1.0' / 0.3m of water for up to 30 seconds. The watertight compartment will also help to further protect your data from pressure, shock, and dust. The ev All-Terrain Case is compatible with the Evolution Series, which also fits the G-DRIVE ev or G-DRIVE ev SSD. This drive is well suited for performing various tasks while working in the field, such as backing up, editing, transferring, and general storage, as it is equipped with a 1TB capacity, a rotational speed of 7200 rpm, and data transfer speeds up to 136 MB/s. While the interface on the drive case is Thunderbolt 10 Gb/s, users are also able to remove the drive from the enclosure, at which point they have the option of utilizing the drive's USB 3.0 port or the drive's SATA interface. Those who wish to use the ev RaW's USB 3.0 interface may connect the drive directly to a system with a USB 3.0 port. Additionally, the ev RaW's SATA interface may only be used with the expandable and hot-swappable storage solution G-DOCK ev with Thunderbolt. While the 1TB G-DRIVE ev ATC with Thunderbolt does come pre-formatted for Mac, it can be easily re-formatted for Windows. When used on a Mac, it is compatible with Mac OS X 10.7+ and also supports Time Machine and plug-and-play setup. When re-formatted and used with Windows, it is compatible with Windows 8.1, 8, and 7. This drive is also compatible with any Evolution Series G-DRIVE ev product. The 1TB G-DRIVE ev ATC with Thunderbolt operates solely using bus power, includes a USB 3.0 cable, and is also backwards compatible with USB 2.0.